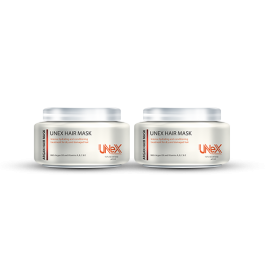 Unex Hair Botox is a revolutionary system of Keratin Hair Treatments, In addition to this revitalizing to the hair ingredient it also proudly has NO FORMALDEHYDE! 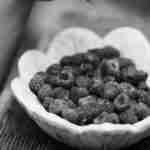 And since with UnexKeratin Hair Botox you wash the hair before ironing it, you will experience now fumes what so ever. Our Unex Brazilian Hair Botox treatment is a total and complete revolutionary experience for you, your clients and salon professionals. The application is a little different and dictates the fact that there will be no harmful or annoying fumes. The time Unex Brazilian Hair Botox treatment will be left on the hair is determined by the nature of each individual hair. Unex Brazilian Hair Botox worked wonders in thin/brittle hair and acts as a total hair reparation treatment. 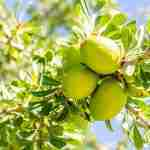 Re-application cannot be applied until at least 2-3 months between treatments. Unex Brazilian Hair Botox has a straightening strength of 80%-95% or more depending on how course the hair was before the treatment, frizz is 100% eliminated and the shine of the hair is unbelievable. This treatment has no fumes whatsoever! This treatment is ideal for Blonde, Light colored and Red Hair because it will not have any color changes if performed correctly! Indulge in our latest technology and enjoy your new beautiful youthful hair today! 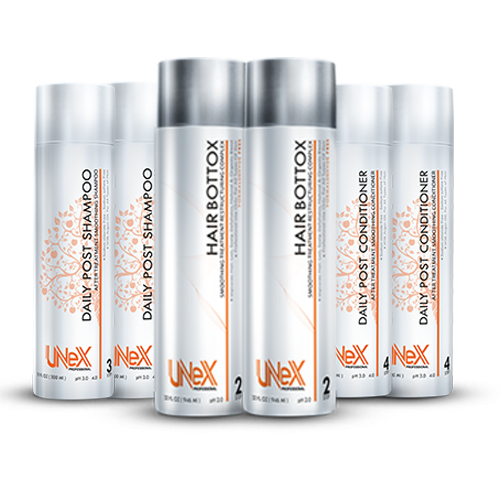 Part hair in 3 or 4 sections, Apply Unex Hair Botox solution in small sections starting from the back, Using an application brush, Apply ¼ inch from the roots, Comb it through the entire hair, Do not over saturate. Comb the solution throughout the hair entirely (the more the hair is brushed, the better the result). Keratin4all.com will not be held responsible for any applications not performed correctly and that are not performed by licensed Keratin4all professionals. Keratin4all can’t guarantee the desired results while using other types of Pre-Care or After-Care Shampoo or Conditioners in combination with The same line products.